ArtsEmerson: The World On Stage will present the Boston premiere of Hershey Felder in "Maestro: Leonard Bernstein," the latest composer work from the creators of "George Gershwin Alone," "Monsieur Chopin" and "Beethoven, As I Knew Him." Performances are set for April 28 - May 13 at the Paramount Center, 559 Washington Street in Boston’s Theatre District. The production is directed by Joel Zwick. Lauded for his compelling performances as the world's greatest composers, Felder returns to Boston with this one-man theatrical event dedicated to the amazing and complex life and career of American composer and conductor Leonard Bernstein. Singer, actor and pianist Felder will trace the maestro's musical and personal influences and struggles while examining his wide-ranging work as both a classical and popular theatrical composer, responsible for such timeless works as "West Side Story," "Candide," "On the Town" and many more. With a personal and professional story spanning the entire 20th century, Bernstein, broke through every artistic ceiling possible to become the world's musical ambassador. Felder and director Joel Zwick have collaborated on this show, which has played to critical acclaim across the country. Bernstein’s story will have special resonance in Boston, a city that helped shape his career. Deep roots in the Eastern European Jewish immigrant community, as well as connections with Boston-area educational and musical institutions, played a significant part in informing the life and work of the most famous American composer of the 20th century. Born in Lawrence, Massachusetts, Bernstein attended Boston Latin School and Harvard University, and studied at the Boston Symphony Orchestra’ s Summer Institute at Tanglewood. In 1973, Bernstein was appointed to the Charles Eliot Norton Chair as Professor of Poetry at Harvard, and delivered a series of six televised lectures on music with musical examples played by the Boston Symphony Orchestra. Taking the title from a Charles Ives work, he called the series "The Unanswered Question." The interdisciplinary lectures borrowed terminology from contemporary linguistics to analyze and compare musical construction to language. The lectures were recreated at the WGBH studios for filming, and are available on DVD. His final appearance as a conductor was with the BSO at Tanglewood in 1990. 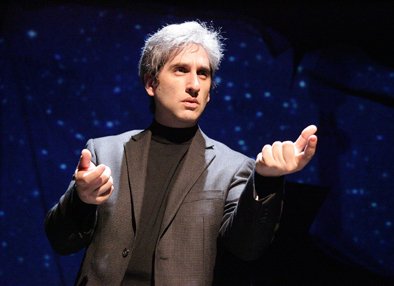 Hershey Felder has performed "George Gershwin Alone "on Broadway, London’s West End, The Old Globe, Ford’s Theatre, American Repertory Theater, Hartford Stage, the Geffen Playhouse (2007 Los Angeles OVATION Awards: Best Musical and Best Actor), as well as at theatres in Philadelphia, Florida, and a year-long run at Chicago's Royal George Theatre. His regional and international appearances include "Monsieur Chopin" at The Old Globe, the Royal George, American Repertory Theater, the Ravinia Festival, the Geffen Playhouse and Hartford Stage, as well as a Command Performance for the Polish Ambassador to the United States, Polish Embassy, Washington, D.C. and the Uijeongbu Theatre Festival, South Korea. His recordings include "Love Songs of the Yiddish Theatre," "Back from Broadway," as well as "George Gershwin Alone"and "Monsieur Chopin" for the WFMT Radio Network Recordings label. He is on the Board of Directors of the Chicago College of Performing Arts and has also been a Scholar in Residence at Harvard University’s Department of Music. Joel Zwick directed "My Big Fat Greek Wedding," the highest-grossing romantic comedy of all time, produced by Tom Hanks. Recent films include "Fat Albert" (with Bill Cosby), and "Elvis Has Left the Building," starring John Corbett and Kim Basinger. He has directed on Broadway, Off-Broadway and Broadway touring companies. Currently, he is recognized as Hollywood’s most prolific director of episodic television, with the direction of 525 episodes to his credit. His New York productions have included "Dance With Me," "Shenandoah" (national tour), "Oklahoma!" (national tour) and "Cold Storage" (American Place Theater). For information and tickets, call 617-824-8400 or visit www.artsemerson.org.